IDW was founded in 1999 and started as a publisher for comic books, graphic novels, and trade paperbacks. 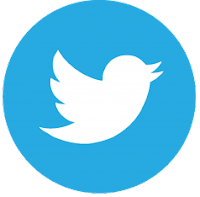 The company has grown and includes IDW Games, IDW Entertainment, Top Shelf Productions, and the San Diego Comic Art Gallery. IDW Games publishes creator-owned and licensed tabletop games. 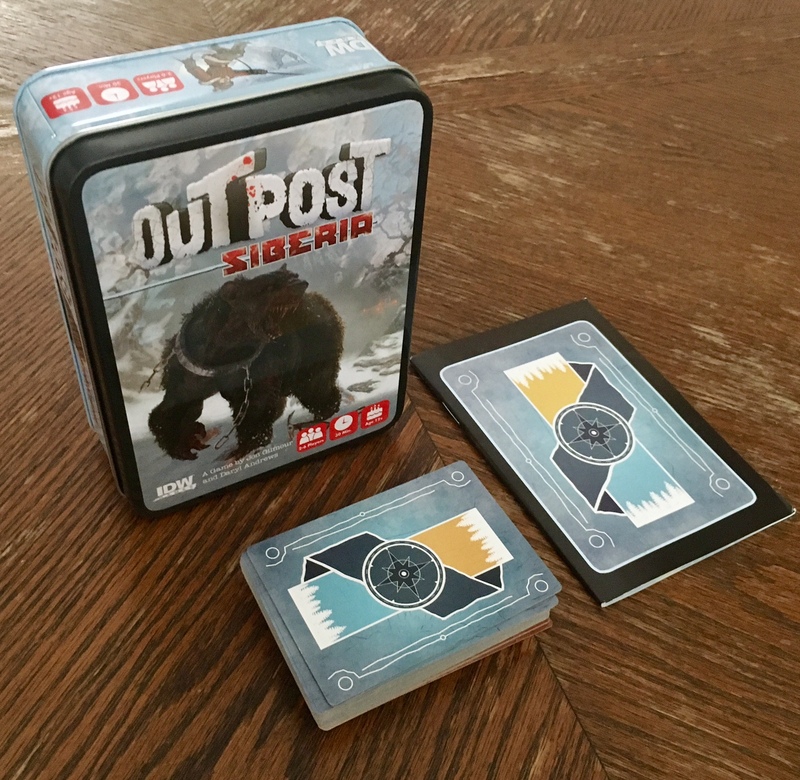 The object of the game is to survive the storm of the century in the isolated, frozen tundra of Siberia. To do this you will need to to not die and get through the expedition deck. This game is a co-op game and because of that, if anyone dies, you all lose. To setup, you will put the cards into 4 different piles: characters, threats, good events, and bad events. Everyone chooses a character to play as. You pick a difficulty level that will either put more good event cards in your deck than bad events, or more bad events than good. 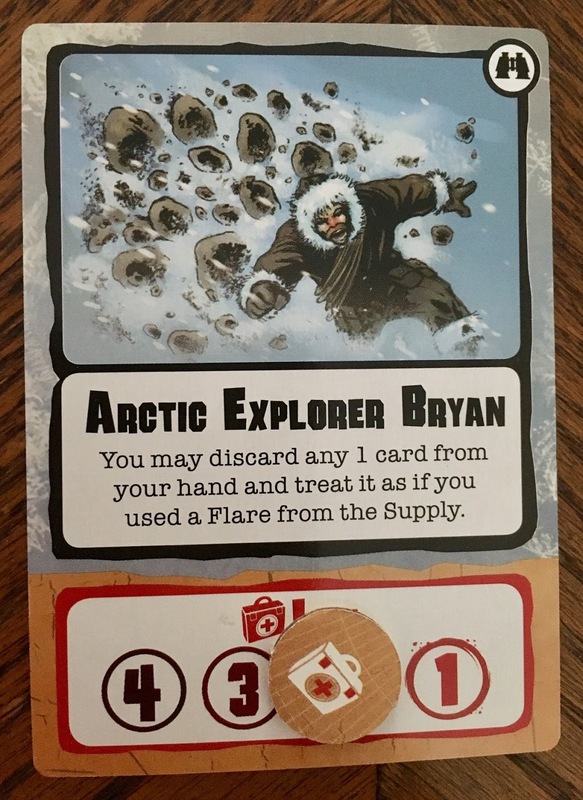 In the expedition deck, you will use the main part of the card for whatever type of card you draw. You will take the remaining good and bad event cards to make the outpost deck. You will use the lower yellow part of the card when drawing out of the outpost deck. During play, you choose who will take their turn in whatever order you want. They will draw 2 cards in the outpost deck. They will add one to their hand to use for combat, and the other goes into the supply (anyone can use these) and is used for the item. 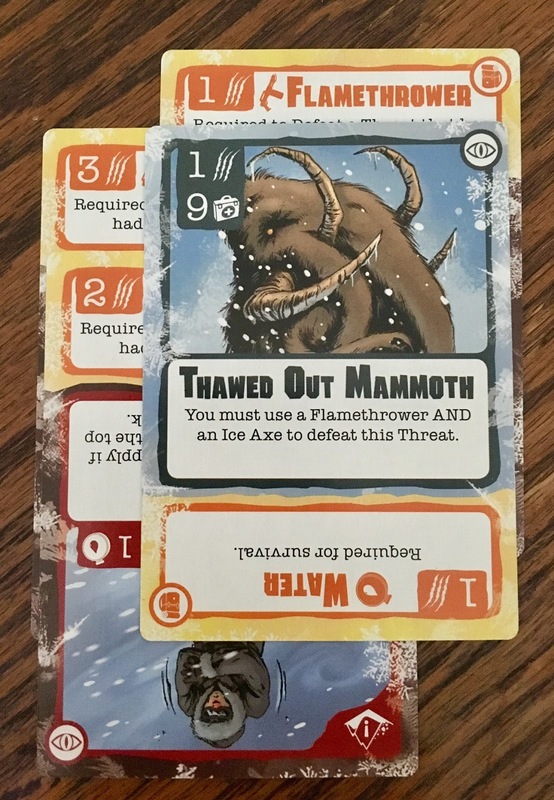 You will then choose to attack if you can (or if you want to), then choose if you want to use any items in the supply, and then you will draw a card from the expedition deck. 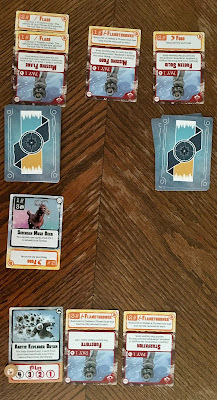 You follow the rules on the card making you discard cards or items, and either performing the event as it reads, or adding a threat to the table. You do this until you get through the entire expedition deck. 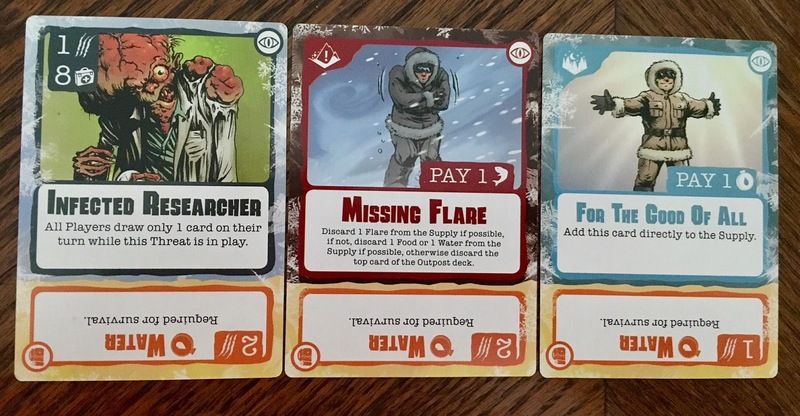 You and your team of scientists are trapped during a bad winter storm and you're stuck in the Siberian tundra. As a team, you are trying to use your items wisely while dealing with random threats that appear in the wilderness. You need to make it through the winter. The theme holds true as you are really trying to survive. Your heath points will go up and down from various events and you may think any second you are gonna take a hit and end the game. You feel the feeling of just surviving until the end. 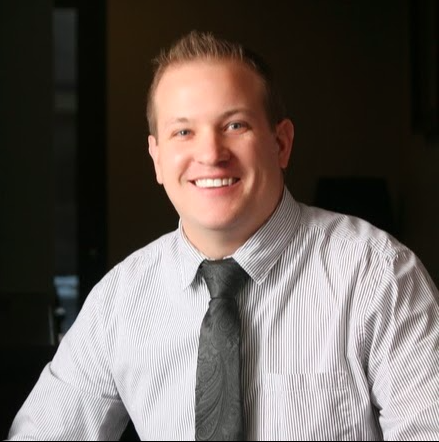 As a card game, you use hand management as well as using your team in a cooperative manner. There is nothing amazing about the mechanics used in the game, but it works for what the game is. The game includes 54 cards and 6 cardboard tokens to keep track of life. The artwork to me isn't anything amazing, but not bad either. I don't have a problem with any of it. The artwork on the 15 good event cards are all the same, and the artwork on the 15 bad event cards are all the same. 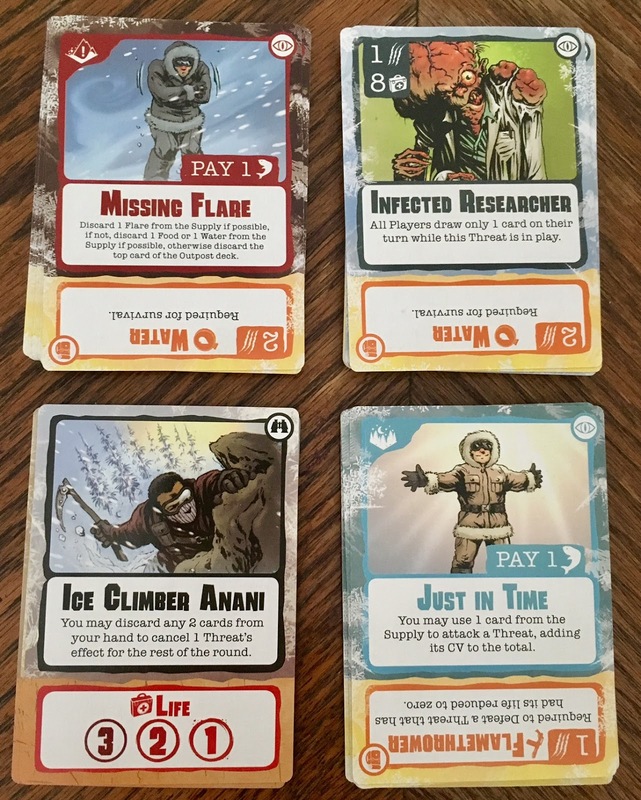 18 threat cards each have different art per card, as do the 6 character cards. The game plays quickly. Recently, co-op games have become more and more popular, and this one is in that category. I think the idea of the game is fun as you are facing mysterious threats. A little confusing due to the cards being used in both decks and for different actions. There are 3 different and separate areas on the cards that are used in different parts of the game. The game has only 54 cards, and there is only so much you can do with 54 cards. Even though the idea of the game seems fun and good, I'm not sure if the execution was that amazing. 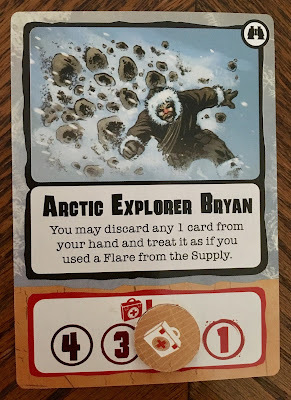 While playing, it just seemed like we were hurrying to get through the expedition deck to finish the game, and not really enjoying any of the random threats or events coming forth. There seemed to be an excess of items of a certain type in the supply. It's hard to put together a great game with so little components. It seems like a decent attempt to put this game together in the way they did. It seems like it is lacking in depth, and the game becomes very dry as you just start playing faster and faster to finish off the deck because there is nothing else to focus on. I would recommend this game to those who enjoy gateway games, co-op games, or survival games. If you like forbidden island, you may like Outpost: Siberia. 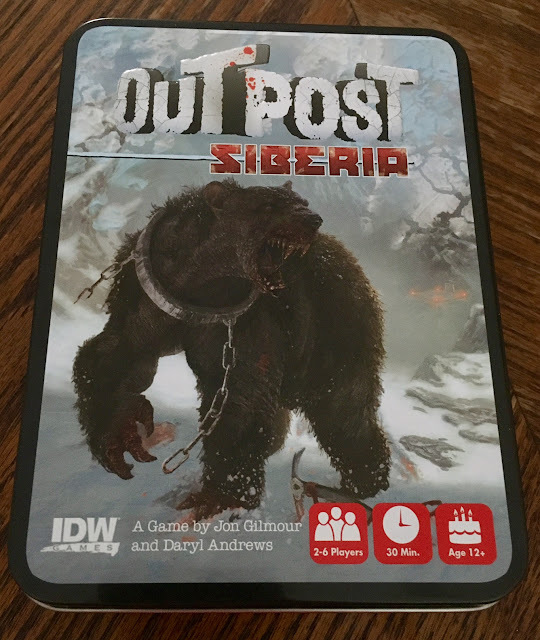 I am giving Outpost: Siberia a 5 out of 10 super meeples.